ALTHOUGH the jib cranes of the docks or those perched aloft during the building of a steel skyscraper are familiar to many, the more impressive overhead travelling crane seems to be less familiar. Yet without the overhead crane it would be almost impossible to handle the great weights of modern machine parts. It could certainly not be done with the degree of speed necessary nowadays. A visit to a steelworks will show immense ladles of molten steel or brightly glowing forgings transported, without giving them time to cool, by a mighty crane high up in the shadows of the roof. An early invention, the overhead travelling crane was originally worked by hand winches. Later, steam engines and boilers were used, to be superseded by the electric drive. An excellent example of modern overhead crane practice is seen in the photograph above, which shows an electric crane capable of lifting a load of 200 tons, and made by the Dominion Bridge Company Limited, near Montreal, for the Canadian National Railway. 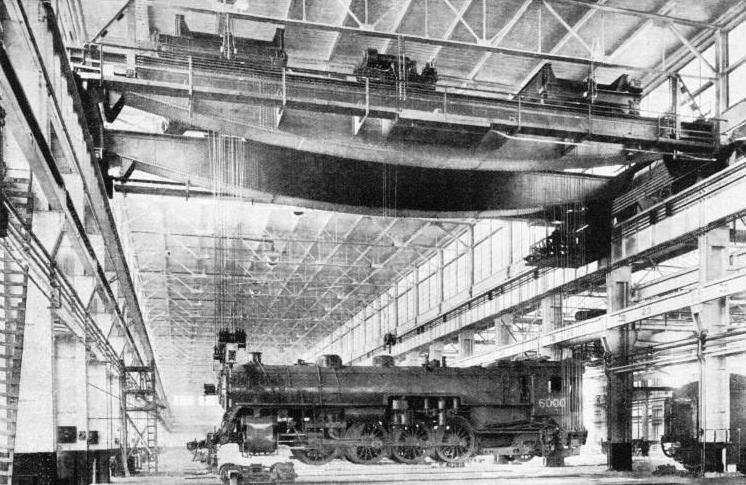 Here, a 4-8-2 locomotive, without its tender, is being lifted from its bogie; but that is only one of the operations of which an overhead travelling crane is capable. With its deep girders of great span and furnished with heavy carriages, the crane can be run from one end of a long shop to the other on the rails of the side gantries. The load can be taken across the shop, the bogie or crab, which carries the winch and crane hook, traversing rails on top of the girders. As both motions can be used together, the load can be taken down the shop in any path desired; thus it can move in a curve if an obstacle is to be avoided, or, should the obstacle extend right across the path, it can be surmounted by lifting the load as the crane travels, just as a steeplechaser clears a fence. Lowering the load is generally done by gravity, powerful brakes being used to stop or check the descent. All these movements are controlled by an operator sitting in a cabin suspended from one of the girders, and having a clear view of the hook and its load. The current for the motors controlling the several motions is picked up from conductors by shoes sliding along them, just as an electric train collects its current from a rail by the side of a line. An overhead crane does not always have two large bogies such as are fitted to the one in the photograph. Often only one is needed, but in large cranes there is generally a small bogie also, so that lighter loads can be handled without using more power than is necessary. The crane illustrated has such an auxiliary bogie, but this is not taking any part in the lifting of the locomotive. The small overhead electric travelling crane is sometimes controlled by suspended pushbuttons, the operator walking on the floor as the crane moves. A useful form of hand-operated overhead crane for light loads is operated by hanging chains passing over sprocket wheels and handled from the door. In electric cranes a large electro-magnet sometimes replaces the hook. You can read more on “The Modern Crane” on this website.